With so many restaurants lined along the two sides of Lorong Mambong, it’s easy to miss out Gyu-Kaku Japanese BBQ restaurant if you are new to Holland Village. How many times have I walked past it when I was in the area? Plenty. I can’t believe that it took me until now to try the Japanese restaurant, but boy am I glad that I finally went there for dinner recently. Gyu Kaku means bull horn in Japanese, but to me, it translates to meat heaven. Besides Holland Village, the Yakiniku restaurant also has other two branches at Chijmes and UE Square. 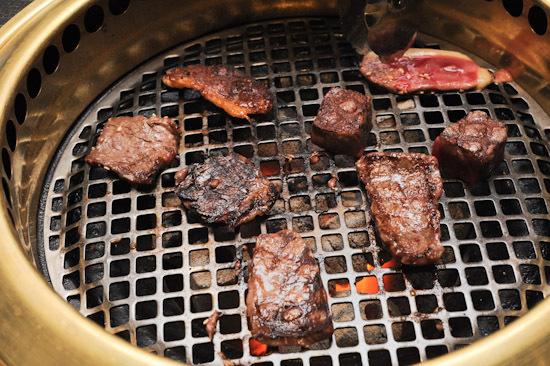 There’s really nothing better than the sizzling sound of wagyu beef over the red-hot charcoal grill. The manager suggested the Fuku Set ($179/2pax, $249/3pax, $309/4pax) which comes with assorted kimchee, aburi bacon, choice of salad, assorted mushroom, wagyu fillet steak, wagyu karubi, wagyu rump cap, kurobuta pork collar, duck breast, gindara miso foil grill, ishiyaki mentaiko and a choice of dessert. 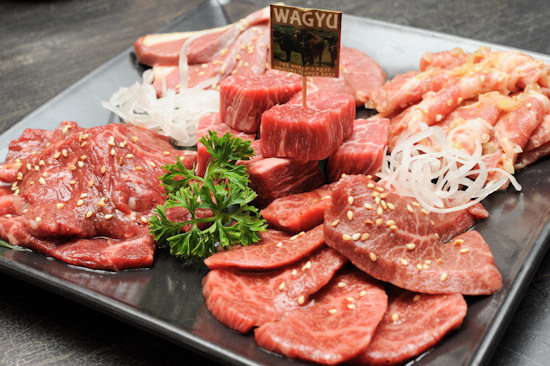 There is also the Warai set ($149/2pax, $209/3pax, $269/4pax) which is slightly more affordable and comes with choices like lamb chop, wagyu tongue, and wagyu nakaochi. This is the Horenso Salad at Gyu-Kaku restaurant, which is essentially a Japanese style Spinach salad topped with bacon and creamy sesame dressing. If it was up to me, I’d call this the awesome-Japanese-salad. I ate a slice of beef. Two. Three. And then half the plate was gone. It was impossible to slow down. They were so good. Oh my god. A piece of Wagyu fillet steak, a bite of wagyu karubi, a mouthful of wagyu rump cap – I can die without regrets now. Halfway through the meal, we shifted our focus to the kurobuta pork collar, duck breast and gindara. The grilled cod was not bad, but I felt that it was a distraction from the beef. Who needs cod when you can have wagyu beef? The same goes for kurobuta pork collar and duck breast. Still, everything was gone in a flash. More meat please! The servings of the Fuku set should be enough for most people, but my brother is a big meat eater, so we ordered more food from the ala carte menu. If I had eaten the Wagyu Brisket ($13.9/small, $19.9/large) first, it might have tasted fantastic, but there was no turning back after we had the wagyu fillet steak and rump cap. Even though we already had a lot of meat, it was impossible to resist the 200g Wagyu ribeye steak ($89.9). Our bellies were bursting when we were done with the steak. This is the reason why I can never be a vegetarian. I was quite amazed that we didn’t smell like BBQ after finishing dinner. The air ventilation of the restaurant was very good; the fumes from the BBQ were ventilated efficiently through the vents. It was also great that the staff came along often to change the grill plate. Gyu Kaku Japanese BBQ restaurant is not cheap. But it serves good quality meat, and I like the fact that you won’t smell like BBQ after a meal. I will definitely come back when I am craving for wagyu beef. It’s one of my favorite eateries! I normally go to the one @ UE Square. Is the meat from japan? @AC- The Wagyu Ladyironchef had was from Australia. We serve Ito-ham Japanese Wagyu from Kagoshima too. There is another Gyu-kaku restaurant at CHIJimes. For three people, it is about $300++ for us. It’s a great place for bbqing high quality meat. One of my favourite Japanese BBQ. I love the pork belly too! It’s super nice. Meat heaven!